One of the world's top resorts incorporating an excellent sports centre with free access to lift ticket holders. Gstaad offer a world class selection of on and off slope facilities and accomodation standards that have become living legends. The resort centre was pedestrianised in 1997. Gstaad is the key part of a series of French and German speaking resorts linked by scenic mountain railway all included in the lift pass price. When will it snow in Gstaad? The next notable snow forecast for Gstaad is 3cm1in, expected on 19 April, with around 7cm3in forecast over the next 7 days. The Swiss Ski Resort of Gstaad is part of the Gstaad Mountain Rides ski area with access to 250km155 miles of downhill skiing, with 144 marked pistes, served by a total of 57 ski lifts. In addition to the skiing in Gstaad itself (250km155 miles of pisted ski runs), the appropriate ski Lift Pass will allow you to ski or snowboard in the other Gstaad Mountain Rides ski resorts of Château d'Oex, Saanen, Saanenmöser, Schönried and Zweisimmen. Gstaad is directly linked by Ski Lift to the ski areas of Anzère. With ski lifts as high as 3,000m9,843ft, skiing and snowboarding is assured throughout the season. Gstaad is one of the world's most famous resorts and the traditional rival to St Moritz, although the two are somewhat different in style. Gstaad is understated whereas St Moritz seems to be a little more obvious about its wealth. Gstaad also has the most ambience, with more attractive chalet style buildings and the whole made all the more pleasant by the pedestrianisation of the main street. The skiing is different too, somewhat limited locally, but the area pass covers half a dozen areas in the vicinity that together add up to offer 250km (156 miles) of trails. What's unusual is that you can hop on and off the mountain trains to get to the base stations of each of these ski areas with gondolas or cable cars, almost invariably departing a few yards away from the rail station in each case. The only exception is the high altitude Diablerets glacier, Glacier 3000, to which you need to catch the ski bus, also included on the pass. The Saanenland area is a wide valley with gentle, wooded slopes that receives more than average sunshine and less than average fog. Gstaad's international fame is also a little more recent than that of St Moritz. It really got on the map in the 1920s when an exclusive school, 'Le Rosey' opened, catering for the children of royalty, politicians, show business stars and leading figures of business and industry. At the same time the Palace hotel opened to cater for the parents of these illustrious offspring. As the children who had become attached to the resort returned as adults the resort thrived, and between 1945 and 1970 the emphasis was on developing the ski area. During the preceding millennium the Saanenland in which Gstaad stands had a mixed history, located as it is on the border of French and German speaking Switzerland it had seen ownership pass to different immigrants from the east and, increasingly, the west. From the tenth to fifteenth century the land was controlled by the Counts of Gruyère, but there was an early alliance of the inhabitants of the valley, and between 1312 and 1455 the locals gradually bought their freedom. The strong influence of Gruyère, still felt today, means that the population of the Saanenland tend to have a similar 'mentality' to the French Swiss, even though they speak in German. Tourism, of a kind, started to get underway in the eighteenth century, when those who could afford to, visited to enjoy the benefits of the climate. By that time the cheese for which the area is also famous was already well in demand. Mountain tourism really took hold in 1905, with the coming of the Montreux-Oberland (MOB) railway. But the Saanenland still has an active agricultural life and, alongside the fur coats, (well, not quite alongside usually) you will find 7000 cows - one for every local - and 90 cheese farms. However, 90% of the population do now work in the tourism sector. The longest possible descent in Gstaad is 10km6 miles long and the most difficult run is the 'Tiger Run'. Gstaad sits between four valleys, each lined with ski centres. In one direction there is a gondola from the outskirts of the village accessing the ski area above Saanen. That skiing continues over the German/French language barrier and on above neighbouring Rougemont. Two more separate ski centres are located above famous Chateau d'Oex, a former home of David Niven and the starting point of the successful circumnavigation of the globe in 1999 by the Breitling Orbiter balloon. All three of these ski areas are on the Ski Gstaad pass. Another valley takes in Schönried, Saanenmoser and Zweissimen, also all on the Pass and recently lift-linked to one another to form the largest single lift-linked sector on the pass. The third valley runs over in to bordering ski pass territory; that of the Alpes Vaudoises resorts of Gryon, Les Diablerets, Les Mosses, Leysin and Villars. A Gstaad area pass valid for four days or more is useable on those lifts as well as at Adelboden and Lenk. However, the first ski area you come to, the high altitude Diablerets glacier, which had its access cable cars replaced in 1999 (separate to the Les Diablerets resort ski area) is included in the Gstaad Pass from day one. Finally, Gstaad has its own 'local' slopes on the Wispile and in a second area up a short valley a bus ride from the centre at Lauenen. The Wispile has some village level nursery slopes, and an easy run at the top of the mountain accessed by a two stage gondola. There's a long intermediate and a long black run from the top station back to the valley. Most of the rest of the terrain at all the other ski areas is graded either easy (60%) or intermediate (30%) and most of it takes place on wide open trails cut through thin woodland on north facing slopes and meadows on the lower slopes. The advanced ski runs are dotted around the area with most of the individual areas having at least one good long black to try. From the Diablerets glacier there's a wonderfully long easy run of 14km (9 miles), with one unavoidable steep black mogul section which eventually takes you back to the ski bus stop at Reusch on the road to Gstaad. You will ski a 1650m (5414feet) vertical on this one descent. Château d'Oex has several black-graded descents including a rather long one down from Monts Chevreuils to Les Moulins, above the village, and heli-skiing is another option. Snowboarders basing themselves in Gstaad have a big range of options to explore daily. At the local area of Eggli, most of which is floodlit, there's a snowpark with quarter pipe and two additional runs with jumps and a boardercross, plus music. There are two other terrain parks at Saanenmoser and Glacier 3000. In the Schönried - Zweisimmen sector there's more special terrain including a special slope for 'boarders above Schönbried, free-riding at Chaltebrunne and cliff-jumping at Hühnerspeil. There are permanent racing runs at Lätzgüetli. At Zweisimmen there's a halfpipe on Rinderberg as well as a boardercross. Over in the French speaking sector there's yet another snowboard park at La Braye above Château d'Oex. Finally, the Diablerets glacier is a popular destination for summer 'boarders who tend to greatly out number skiers. Although there are a large number of T bars to contend with in the area, 17 of the lifts are gondolas or cable cars (trams) accessing the highest points, and it's all downhill from there. Not surprisingly, the Gstaad area has been voted one of the best 'boarding zones in Switzerland. We don't currently have confirmed season dates for Gstaad. NOTE:- Lift and Piste openings are always subject to Snow Conditions in Gstaad. Gstaad is able to make snow, with 600 snow cannons. The 61 ski lifts of Gstaad are able to uplift 53,000 skiers and snowboarders every hour. Gstaad is in the Swiss Alps in Gstaad Mountain Rides, Bern, Switzerland. The nearest airports to Gstaad are Berne, Sion and Geneva. There are eight airports within three hours drive. Gstaad is able to cater for all types of après ski, but of course the top night spots don't come cheap. The top venue in town is the Greengo nightclub at the five star Palace hotel. However, the resort is usually lively as soon as the lifts close and, with a lot of non-skiing tourists, even earlier. Roaster bar at the Gstaaderhof, Rialto Bar as well as Sammys, the Dorfli Piano Bar in the Ermitage Golf Hotel, Apli Bar and Richi's Pub or Pubbles are normally all popular. Apart from the wide ranging sports facilities you can take an evening toboggan run, sleigh ride or try bowling. Visits to the cinema or the Chesery Casino, which also has dancing, are other options. There are live bands daily at the Grand Hotel Park and the Hotel Ermitage, and discotheques at the Alpin Nova (Grotte) as well as Chlosterli in Grund. The Kristall Night Club has dancing as well as cabaret acts. Want to Know when it Snows in Gstaad? 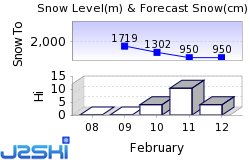 Click above to get Snow Reports by e-Mail for Gstaad. By doing so, you agree to Our Rules. Other Ski Areas within Gstaad Mountain Rides. 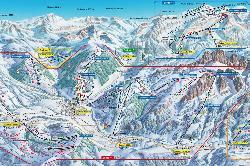 Ski Areas linked by ski lift to Gstaad. Other popular Ski Areas near Gstaad. Ski Hire Shops in Gstaad. For current snow conditions, see our Gstaad Snow Report. Want to ask about skiing and snowboarding in Gstaad? Or contact Gstaad Tourist Office. Note :- The information on J2Ski concerning Gstaad, where not clearly factual, is opinion only and is neither definitive or exhaustive. Warning :- Snow Sports are Dangerous! Skiing, snowboarding and all winter sports involve risk of serious injury or death. You MUST confirm all information, especially snow and weather conditions, in Gstaad before you ski or board. You participate at your own risk.